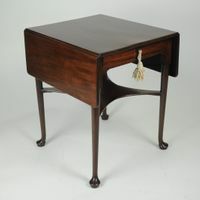 "INCE & MAYHEW Tea Table"
A fine quality Hepplewhite period mahogany tea table attributed to Mayhew and Ince. The hinged top with moulded edge and concave underside above a plain frieze and standing on turned tapering legs headed with moulded ovals which appear to be unique to this celebrated company. With its destictive elongated 'Palyreen' oval paterae, This tea table is closely comparable with The side table sold at Christies and several other pieces known to have been supplied by Mayhew and Ince.